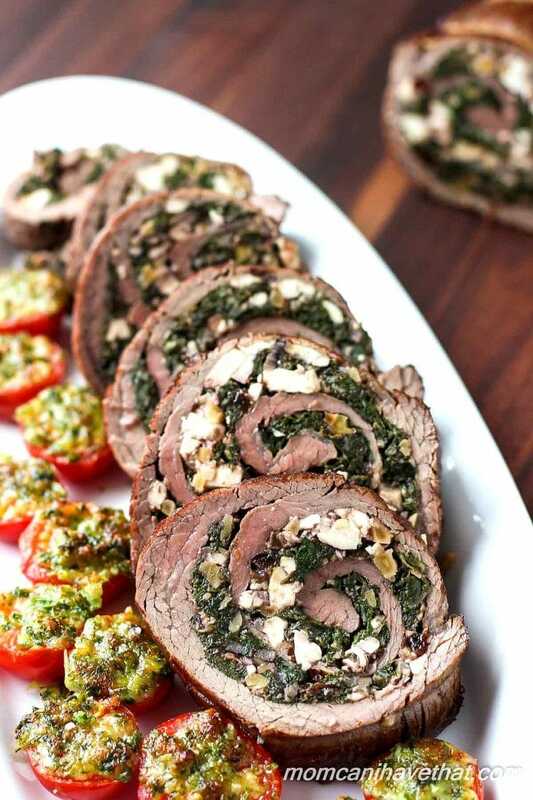 A pleasing presentation and a “side, inside” makes this Swiss Chard Stuffed Flank Steak one of my new favorite meals! It’s no big secret that I love me a good steak. I have several great steak recipes on the blog, some of which make the use of “leftover steak” – Yes, I realize that’s an oxymoron. Who has leftover steak? I confess that I don’t always remember that beef can be almost as versatile as chicken. And just like chicken, it can be stuffed with all kinds of yummy things like mushrooms, sun dried tomatoes, spinach, arugula or Swiss chard. Yum! Since re-joining our local CSA a few weeks back, I have fallen-in-love with vegetables again. Trying to use each and every vegetable in that CSA box, in a timely manner, has forced me to be a more creative cook. And since I don’t enjoy making sides to accompany our dinner, I try to combine dinner and sides into 1 dish as much as possible. So finding myself in the possession of quite a lot of Swiss chard, and a flank steak, I set out to combine my vege and protein in one dish — Swiss chard stuffed flank steak. Yum! I wasn’t sure my kiddos were going to like it, but was pleasantly surprised that the meal received two thumbs up. It may have been in part from the salty and tangy feta cheese I added to the stuffing or the few raisins I added for just a hint of sweetness. Cranberries would be a great sub for the raisins and pine nuts for the walnuts. 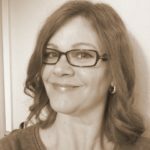 My husband is deathly allergic to pine nuts or I would have used them instead, but we love walnuts so – no harm, no foul. Serve this delicious stuffed flank steak with a simple salad, rice, potatoes or those great cherry tomatoes you see in the picture! This fantastic flank steak is stuffed with sauteed garlicky Swiss chard, salty feta cheese, sweet raisins and toasted walnuts. Preheat the oven (or a toaster oven) to 350 and toast the walnuts until they are lightly browned and fragrant. Chop finely. Meanwhile, wash, stem and roughly chop the Swiss chard. To stem the Swiss chard, fold it in half and with a sharp knife, cut out the rib from top to bottom with one nice slice. Stack the halves, cut again lengthwise and give it a few good chops horizontally. Set the Swiss chard aside in a very large bowl. Preheat a frying pan over medium heat and add the oil. Next, add the onions and garlic and saute until softened. Add as much of the Swiss chard as the pan can hold and as it wilts, turn it over in the pan and add new Swiss chard until all is wilted and tender. Add the lemon zest and juice and stir. Taste and season with salt and pepper. It should taste good at this point, because it won't magically taste any different in the stuffed flank steak. 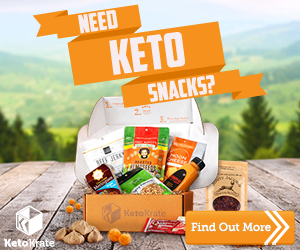 Season it until you like it! Let cool. While the Swiss chard is cooling, take a sharp knife and starting along a long edge, slice the flank steak in half, horizontally or lengthwise, stopping about 1/2 an inch from the other side. Open the flank steak like a book. Rub oil into both sides and salt and pepper liberally.Snip each of the raisins in half and into thirds if large. Mix the cheese, walnuts and raisins into the Swiss chard. Spread the Swiss chard stuffing onto the flank steak leaving a 1/2 border all around. 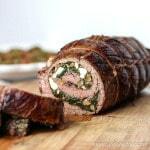 Roll the flank steak tightly around the stuffing and tie it with linen or cotton kitchen twine at 1 inch intervals. 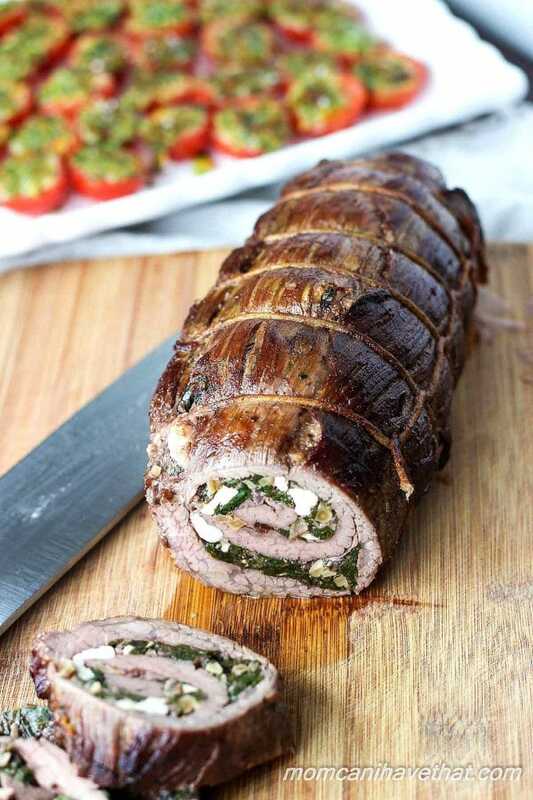 Grill Method: Grill the stuffed flank steak until the outside is browned and the inside temperature reaches 160. Remove from the heat and let rest 10 minutes before slicing and serving. Don't forget to remove the twine before slicing! 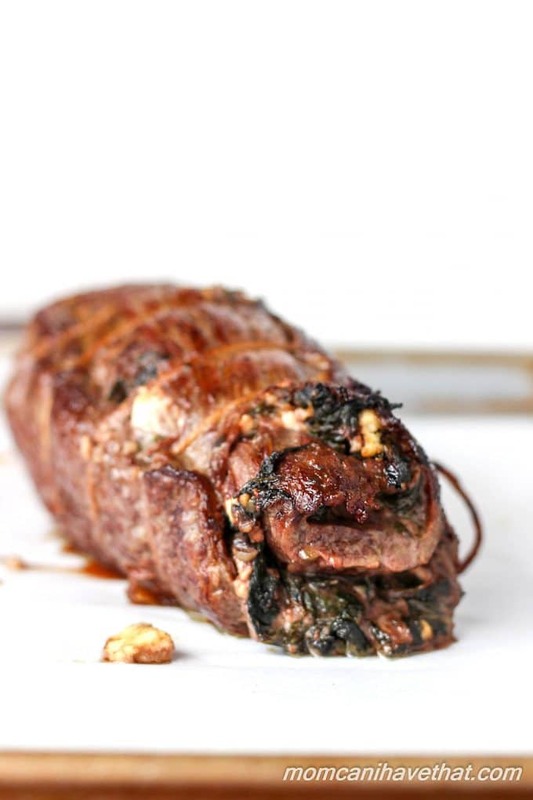 Let the stuffed flank steak rest at least 10 minutes before removing the kitchen twine and slicing. Oven Method: Preheat the oven to 375 degrees. Preheat a large skillet oven medium high heat. Add 2 tablespoons of oil and brown the stuffed flank steak on all sides. Place the skillet into the oven and cook for 30-40 minutes depending on your desired degree of done-ness. Let the stuffed flank steak rest at least 10 minutes before removing the kitchen twine and slicing. Don't forget to remove the twine! 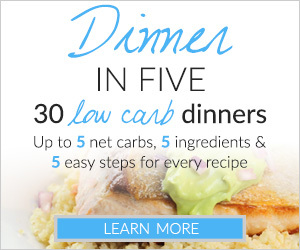 Serves 8 at 5 net carbs each. I am not understanding how to butterfly the flank steak. It is done lengthwise, correct? The way you say start at the short edge make me think it would end up on long but not a wide at all piece. What am I missing? I love flank steak, but haven’t had any in forever — this is such a creative dish and so beautiful to look at, too! I so appreciate good dinner and sides recipes. Keep them coming. 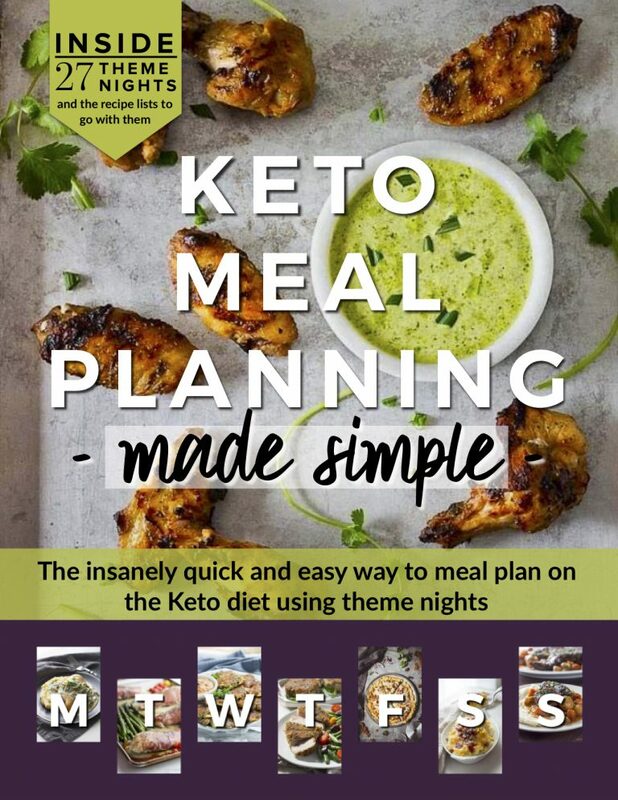 Kim, this looks lovely! But I don’t see how much raisins you use in the ingredients list.